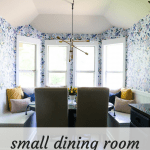 We took on the One Room Challenge this spring and have been renovating our small dining room over the last six weeks. 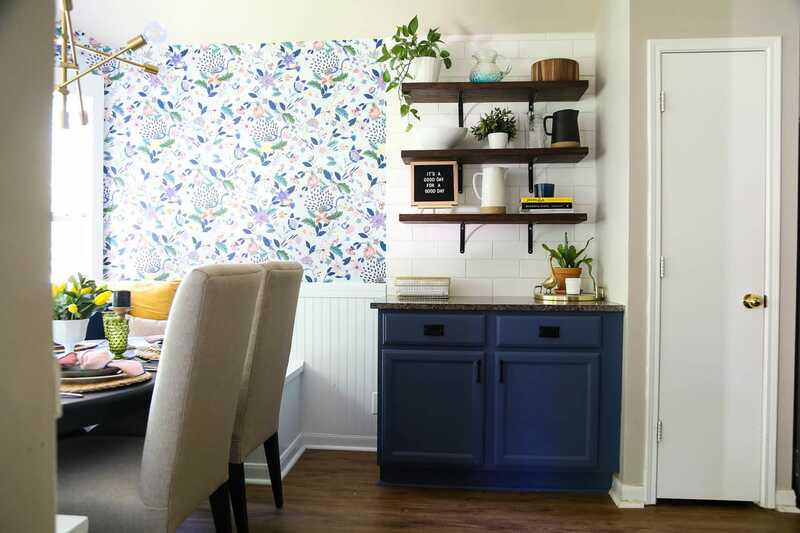 It’s finally done and today we’re sharing the big reveal – hopefully, it will give you some ideas for your own dining room renovation! 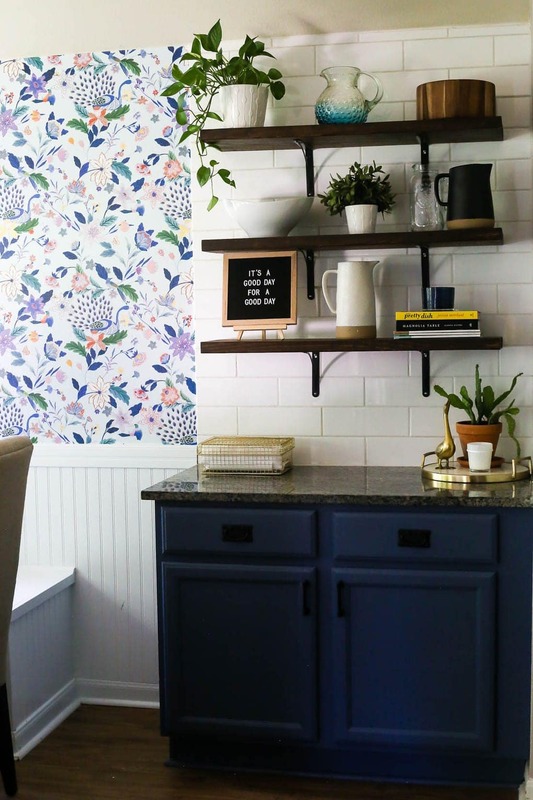 If you’ve been following our journey, you’ll know that six weeks ago Corey and I committed to tackling an entire dining room (or, really, a breakfast nook) renovation in just six weeks. We had lofty goals, including replacing our kitchen backsplash, building a huge bench in the bay window, and adding wallpaper. There were (many) times where I wasn’t sure whether or not we were actually going to get it done in time, but we did it! Week 1: We revealed the plan and all of the lovely “before” photos. Week 2: We hid our trash can and added trim around the windows. Week 3: We started building the bench and started tiling. Week 4: We kept working on the bench and tackled the kitchen backsplash. Week 5: We finished the banquette and shared the process for building it. And that brings us all the way back to week 6 – we’re done! I’ve been sharing videos every week of our progress, but I have to admit that this week, I slacked. We were so busy scrambling to finish everything up that I just never thought to pull out my camera. But, I promise I have tons of photos to make up for it. 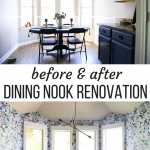 Before I dive all the way in and start chatting about the design for our small dining room and sharing the finished photos, let’s take a quick walk down memory lane with a couple of before & afters, shall we? First up: the dining room – the day we moved in and today. 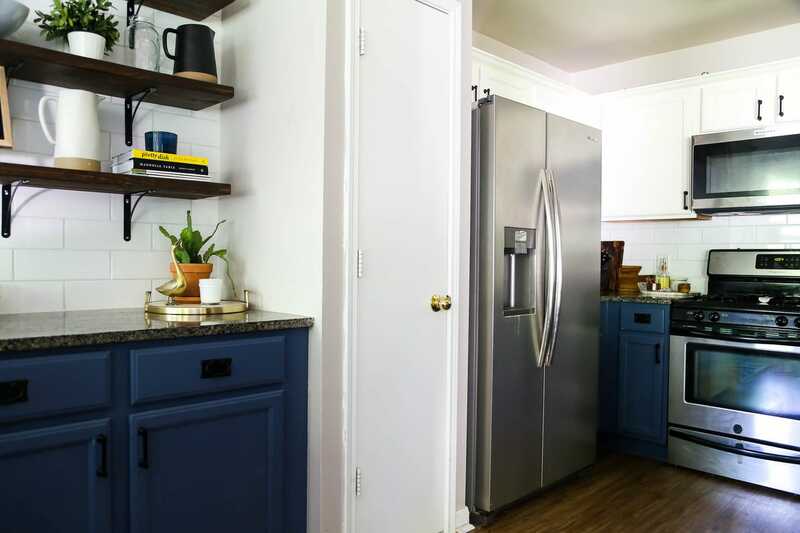 I can’t even believe how different this space looks now – the transformation is really kind of incredible. 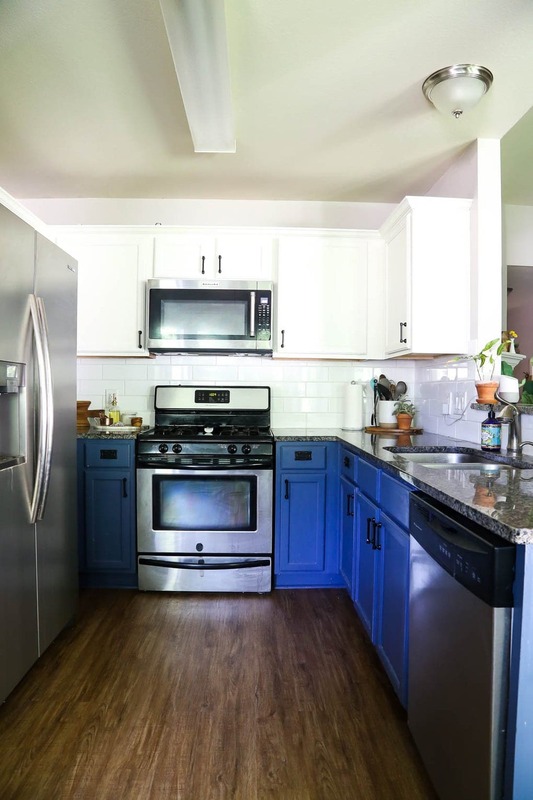 And, of course, we have to take a before and after look at the kitchen as well, since it got drug along on this little makeover. 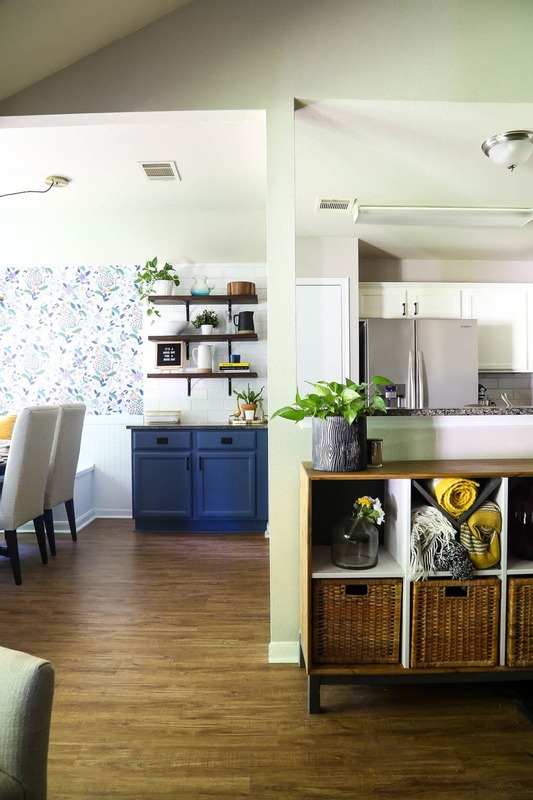 The kitchen still needs quite a bit of work – particularly in the lighting department, but it feels much more cohesive with the dining nook now, and these two spaces honestly make the rest of my house feel a little bit boring in comparison! NOTE: I’ll link all sources at the bottom of the post, in addition to throughout the post as I mention things. If you see something you love that I don’t mention, just leave a comment and I’ll be sure to add it in! 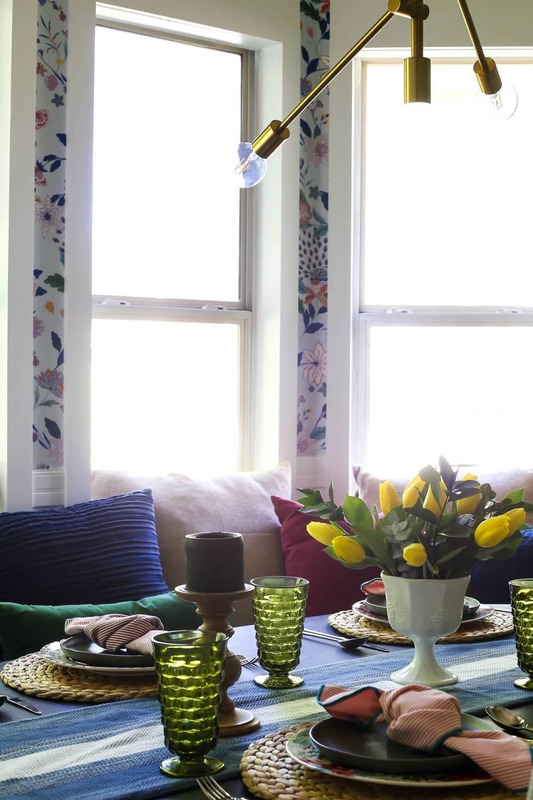 Obviously, the biggest statement-maker in this tiny little space is the wallpaper. 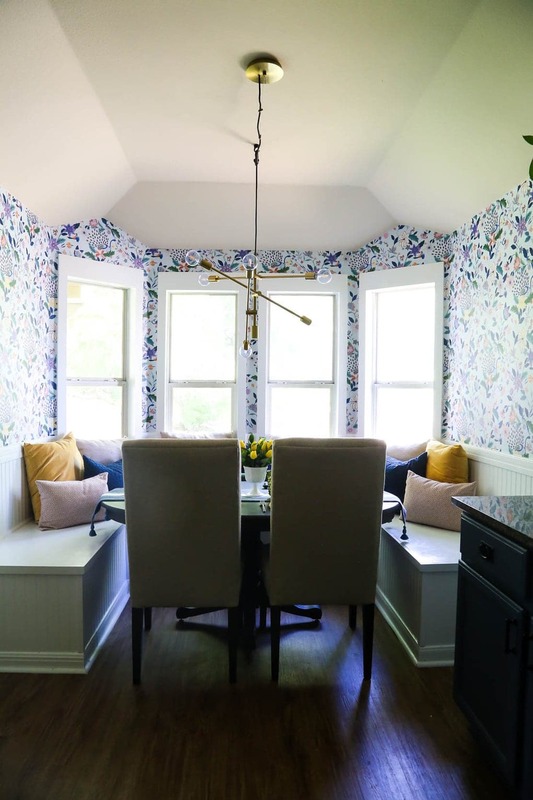 We knew from the very beginning of this renovation that we wanted to do wallpaper on the upper half of the walls – this space is visible from just about all of the main living areas of the house, and we wanted it to be kind of the centerpiece of our house. And really, it’s the star of the show around here now. We wanted something bold, colorful, and a little playful. 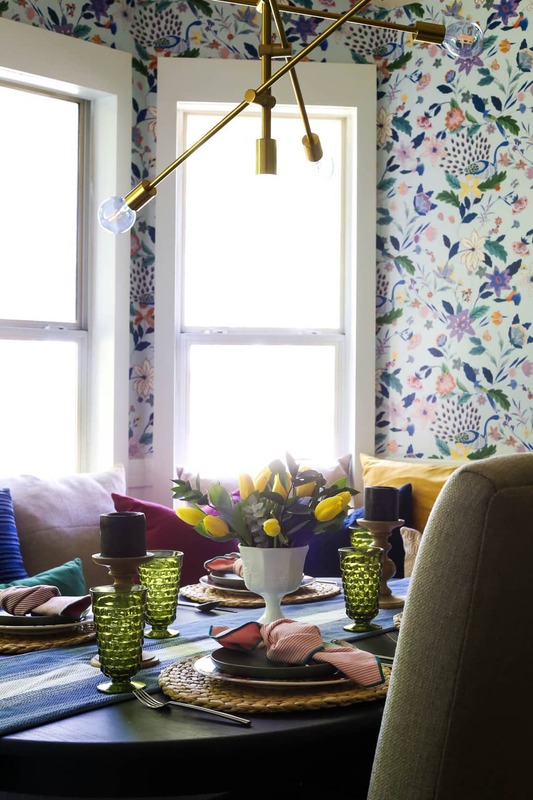 Corey’s only request was birds, and I wanted something with a lot of movement and color – this Sylvia wallpaper from Anthropologie ended up being the perfect solution to make both of us happy. It was a bit of a splurge at $128 per roll, but we only needed two rolls to do the entire room and we snagged it during a 20% off sale so it was just over $200 for this whole project. I don’t know about you, but I think $200 is totally worth it for this kind of impact! Another splurge in the room is the lighting. We had originally planned on creating our own light fixture – we wanted to do a larger version of the light we made for our master bathroom during the last One Room Challenge, but once we started pricing it out, we realized that to make it the size we wanted, it would end up costing just over $200 for all of the supplies. That’s not crazy expensive for a chandelier, but we also knew that we could easily find something a little more exciting for about the same price. 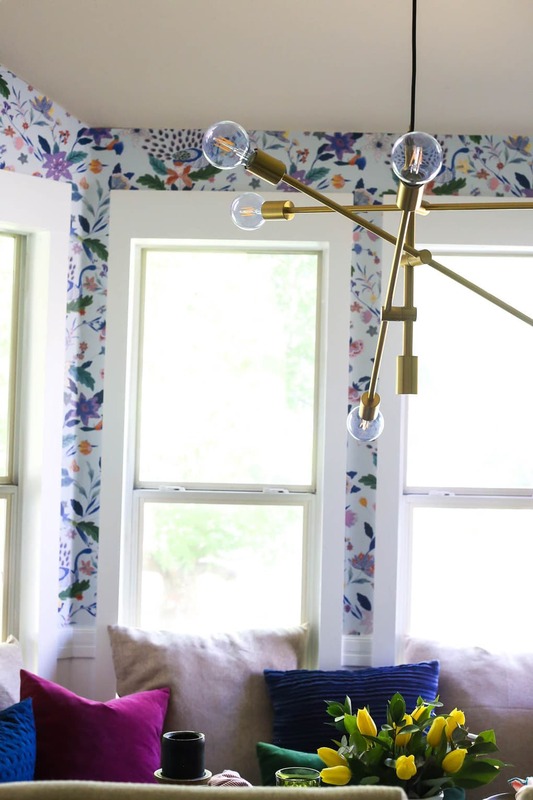 After a little research, we realized that the Mobile Chandelier from West Elm was just a little bit more expensive (and, again, we grabbed it during a sale! ), and would be way more impactful than something simple. The other big project we wrapped up this week was the open shelving. 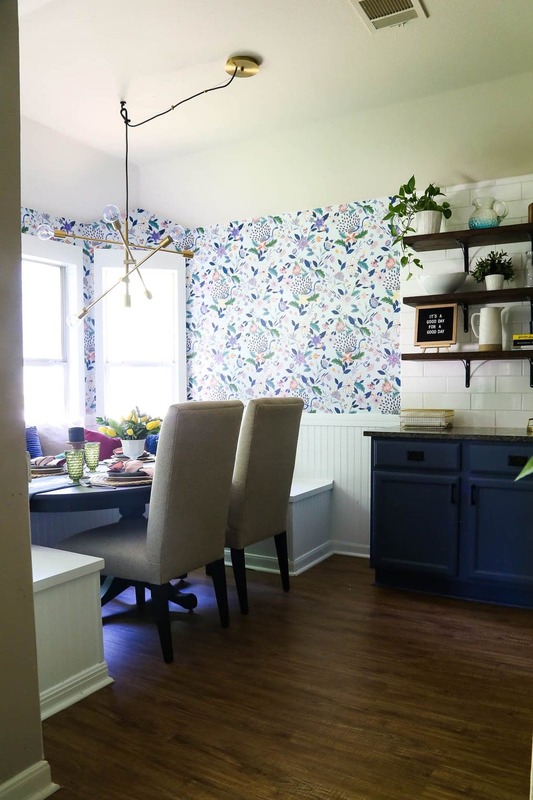 We debated whether or not we wanted to take the upper cabinet in this section of the room down or not, but our goal was to make this space feel a bit more integrated with the dining room, and I think removing it was definitely the right call. 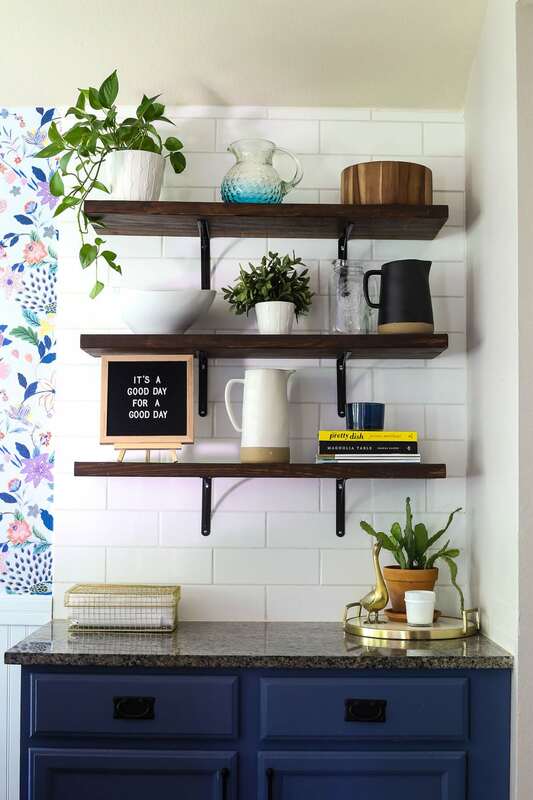 We used the same method we used in our last kitchen to install three shelves (they’re stained with Varathane’s Dark Walnut), then I shopped the house to style them. There are a few things I’d actually like to purchase for over here – like a pretty, shallow basket to hold cloth napkins – but I’m just excited to have this pretty display space! The one thing we did buy for the shelves was a new letter board. We still adore our larger felt letter board, but it was too large to fit on the shelves and we really wanted to be able to tuck a letter board up there. We’re going to give our other letter board a home elsewhere in the house, but we found this one on Amazon for an incredible price – and it even came with a bonus smaller letter board that I’m going to use in the nursery, like we talked about in this post about where to buy a letter board. I think one of my favorite changes this week, despite all of the other amazing stuff that happened, was that we finally filled up our giant banquette with cozy pillows. It might look like they’re just casually tossed on there but let me tell you that finding the perfect pillow combination and arrangement took two days of shopping, styling, returning, and pulling my hair out. Having the pillows on the bench makes it feel so cozy that I honestly find myself sitting there sometimes long after dinner is done because I’m just comfortable. This is Jackson’s new favorite spot in the house, and he eats every meal curled up on top of the pillows now (though, we’re still working on learning that they’re functional and not a playscape). On, and for those of you who (like me) were cringing every time you saw our dining room over the last six weeks and noticed our sad little folding chairs, you can all rest assured that we had a plan in place for something much prettier (and more comfortable)! These gorgeous chairs are the armless version of the Bassett Furniture chairs that we have in our living room (they’re the Austen Upholstered Side chair, and you can find them right here – we have the armchair version in the living room). Bassett was kind enough to send us these chairs to go in our dining room renovation and I’m so glad we went this route because they coordinate perfectly without being too matchy. It’s such a tiny space that you can see all four chairs when you’re sitting on the couch and they flow really nicely. And that, my friends, officially wraps up our dining room renovation. It feels so good to be done! I mean, at least we’re done until we’re ready to tackle building a new dining table – because this one is a bit too small for the space and is much too short (it’s a few inches shorter than standard and has a thick apron underneath, so it doesn’t make for ideal sitting conditions on our bench). But, for now, we’re done. I want to send out a final, HUGE thank you to the brands who worked with us on this renovation – Home Depot, Jeffrey Court, and Bassett Furniture. We couldn’t have tackled this major of a renovation without their help, and we’re still pinching ourselves that we get to work with such amazing brands on the regular. 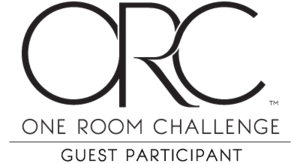 Don’t forget to check out the other AMAZING room reveals over on the One Room Challenge linkup page! If there’s anything you see above that you’re interested in tracking down for your own home, I’ve tried to gather all of the links in one place here. Please let me know if I missed anything, though, and I’m happy to track it down for you! 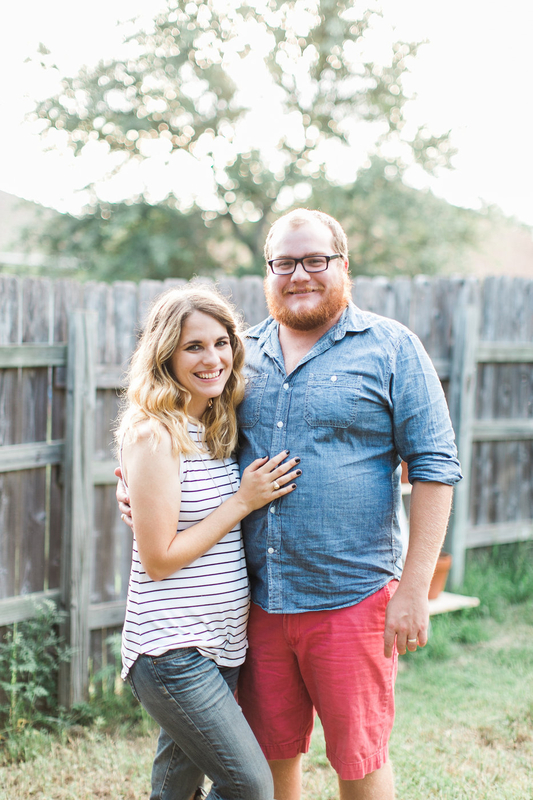 Now that this massive project is over, we’re going to (finally) get our garage workshop organized and wrap up a couple of projects in Jackson’s room, and then it’ll be time to start chatting all things nursery! Get excited! I can’t even believe this is the same space… and that your bench is am addition- it looks like a built-in. You guys nailed it, love!!! And that wallpaper is PERFECT, girl! Aw, thanks! We LOVE it! I love it! 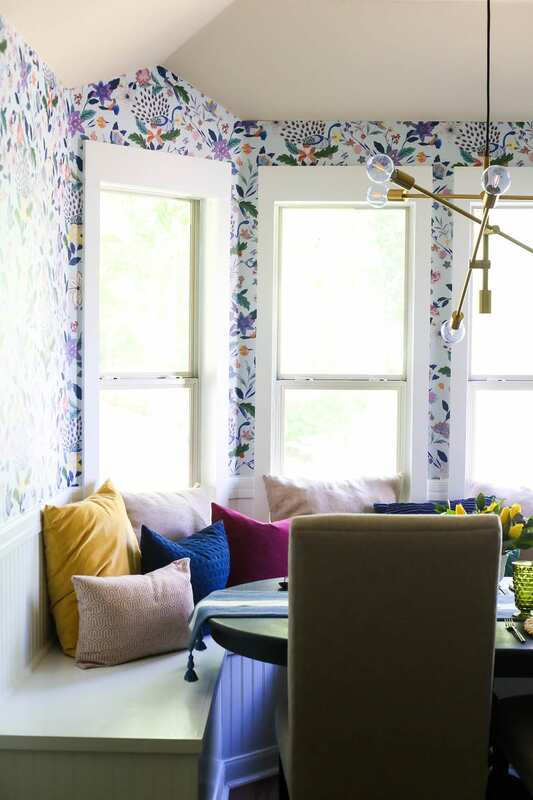 The wallpaper and those pillows play so nicely together and you’re right when you say those “effortless” pillow combinations are really anything but. I lovethat you used such a bold wallpaper. I love colour and the walls as well as your beautiful kitchen cupboards are dreamy! The makeover is just fantastic, I like the Mobile Chandelier especially. Cool. This is fun! I have a special place in my heart for small spaces 🙂 The wallpaper turned out lovely, too. Well done guys! This turned out so pretty, good job;) And I hear you on the pillow choices, it’s so hard to get the combination just right! Thank you! And yes, pillows are always tough! Amanda! You did a beautiful job!! I’m in love with that wallpaper and all of your colourful accessories. Beautifully designed my friend! small but mighty! love all of the colors- such a beautiful space! Y’all always knock it out of the park and this makeover is now different. Way to go! Your dining room is beautiful! 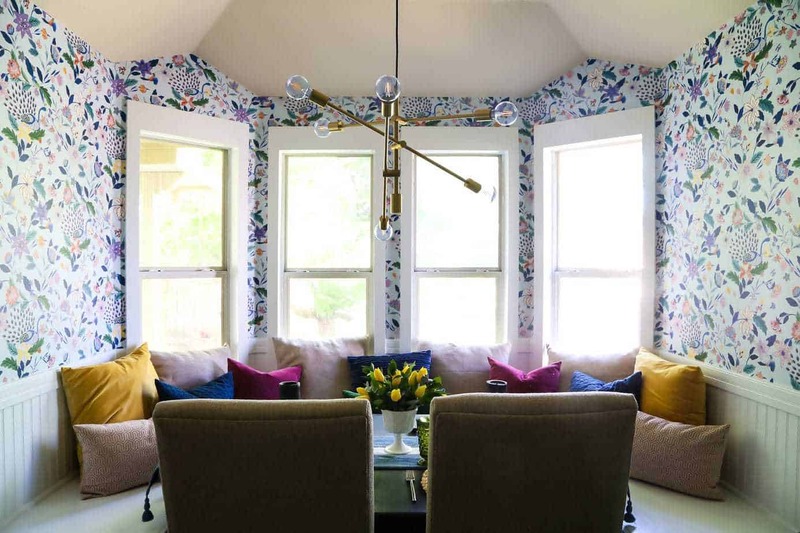 Love the banquette and your color choices. Well done! Lovely “new” room great job! 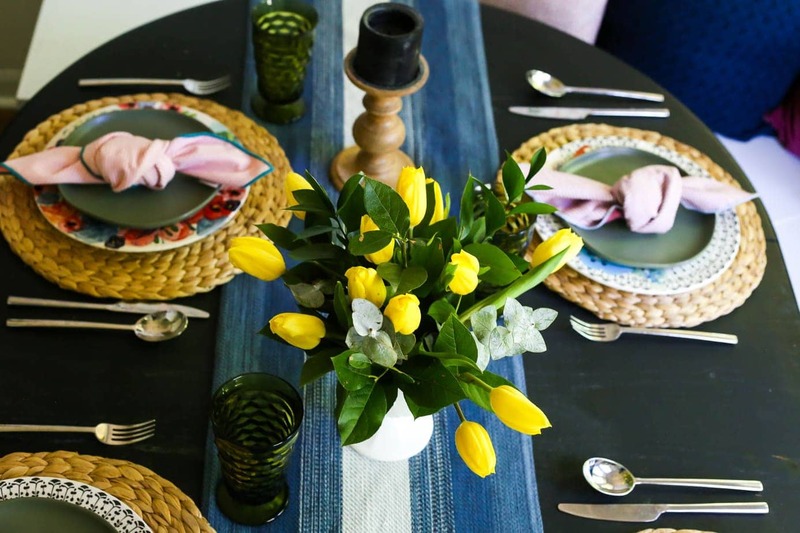 The table runner, where did you find that? Thanks. Thanks so much! The runner is from Target a couple of seasons back – it’s not available on their website anymore, but here’s a similar option! That wallpaper is gorgeous! This is such a cozy and inviting space! It would be my favorite too. Congrats!! What a beautiful dining space!!! I’m in love with the wallpaper and lighting and think they were both well worth the splurge. I’m super impressed with the built-in seating you two built! 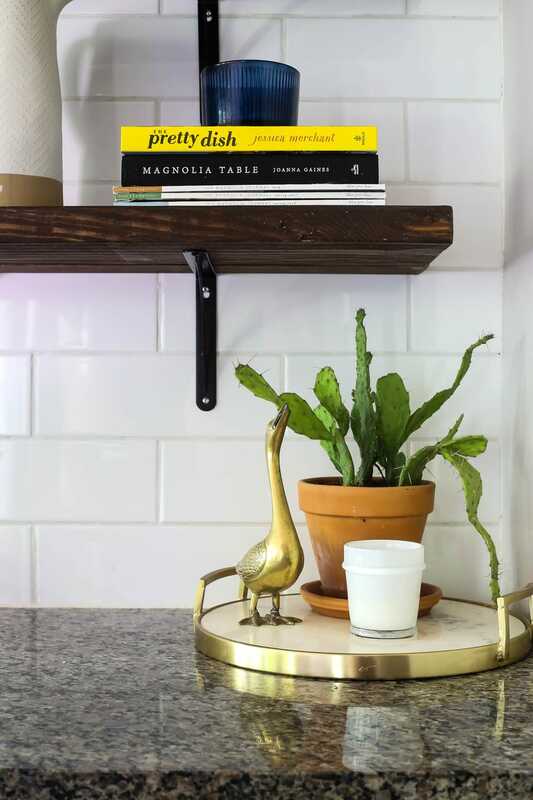 Also, those new open shelves are going to be so fun to style throughout the year! 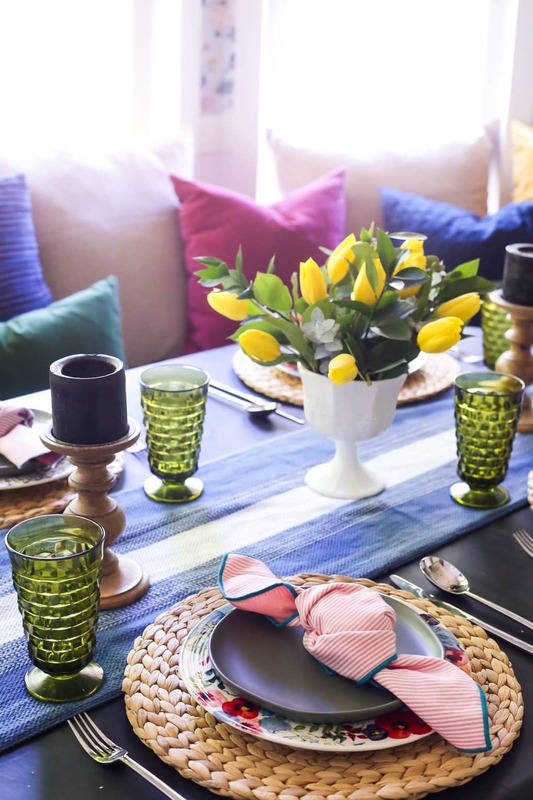 Your table setting looks so fun too – love all the color. Awesome job! Thanks so much, Emily!! We’re REALLY enjoying the space so far!! The wallpaper is AMAZING!! I am now trying to convince my husband that our dining room needs a banquette! It would be perfect to go along with the dining room table I’ve inherited from my mother! I can’t wait to show him these pictures so he can visualize. Our dining room is a very similar space to yours. This is incredible!!! 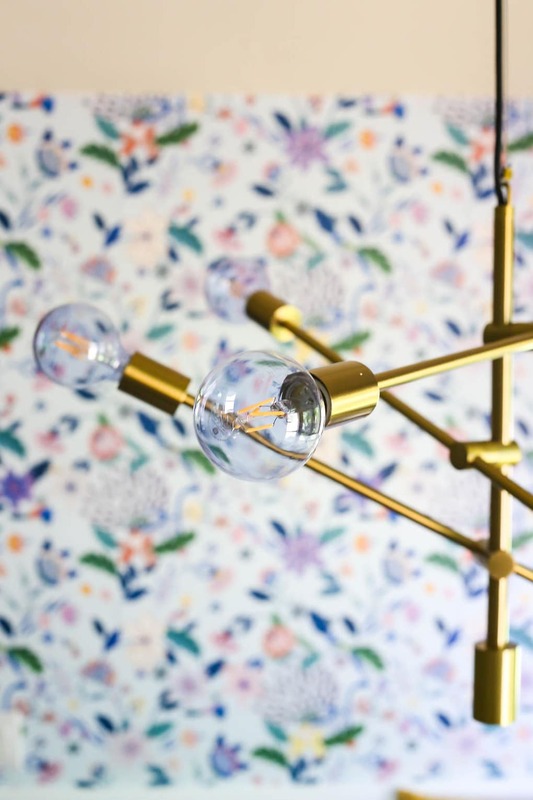 I seriously need that light in my life and the wallpaper is stunning! Great job!!! Totally motivating me to makeover our dining room next. Love the makeover! All looks beautiful. I do agree I the chair backs though. 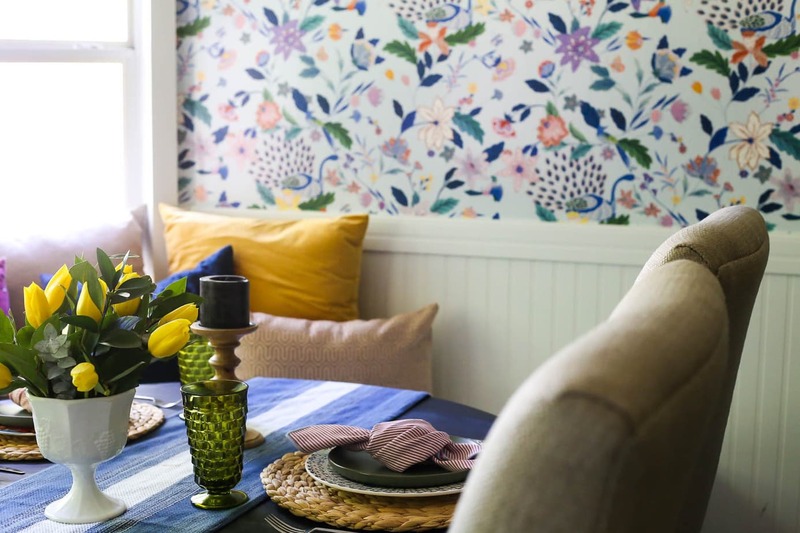 It takes away from the table and wallpaper – as it blocks the view! I’d actually love to see a picture of the dining room with no chairs. Thanks! And I think it’s hard to tell in photos, but in person the chairs don’t really block the view at all. And I don’t mind the high backs – it makes them incredibly cozy to sit in!